You are currently browsing the tag archive for the ‘Clara Josephs’ tag. Promotional for Roger’s Gardens “Day of Art,” Sunday, March 1 features a painting in progress that BAGSC member Clara Josephs was working on during the last year’s “Day of Art” at Roger’s. 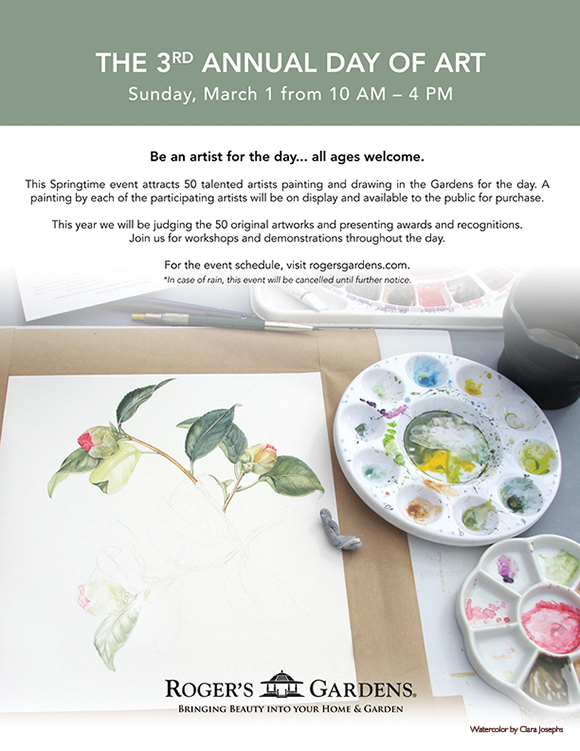 Roger’s Garden is proud to present their 3rd Annual “Day of Art,” Sunday, March 1 from 10 AM – 4 PM. (In case of rain, this event will be cancelled until further notice.) For the event schedule, visit the Roger’s Gardens’ Art Gallery page. This Springtime event attracts 50 invited plein air and botanical artists painting and drawing in the Gardens for the day. A painting by each of the participating artists will be on display and available to the public for purchase. This year Roger’s will be judging the 50 original artworks with awards and recognitions. Open to the public at no charge, all visitors will have the opportunity to participate in scheduled workshops and demonstrations. BAGSC members Diane Daly, Clara Josephs, Patricia Mark and Deborah Shaw will be participating in the event, and BAGSC will have an information table about botanical art, our group, and our upcoming events and plans. 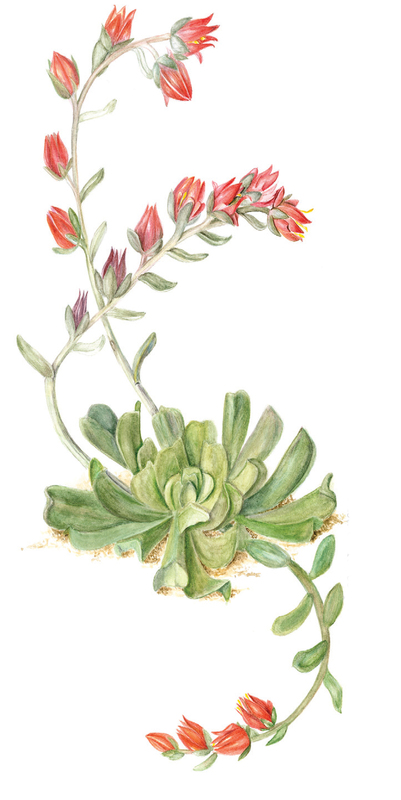 Deborah, Clara, and Diane will be teaching a free “Drawing in your garden” introductory botanical art workshop from 2 pm to 3 pm on that afternoon. The workshop is free and open to the public, no art experience required. 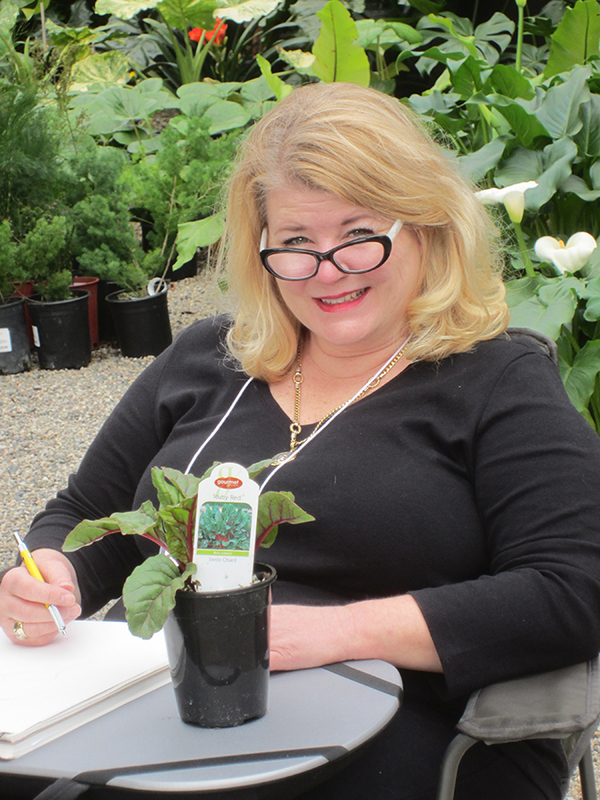 Roger’s Gardens will supply basic drawing materials, or participants can bring additional supplies. 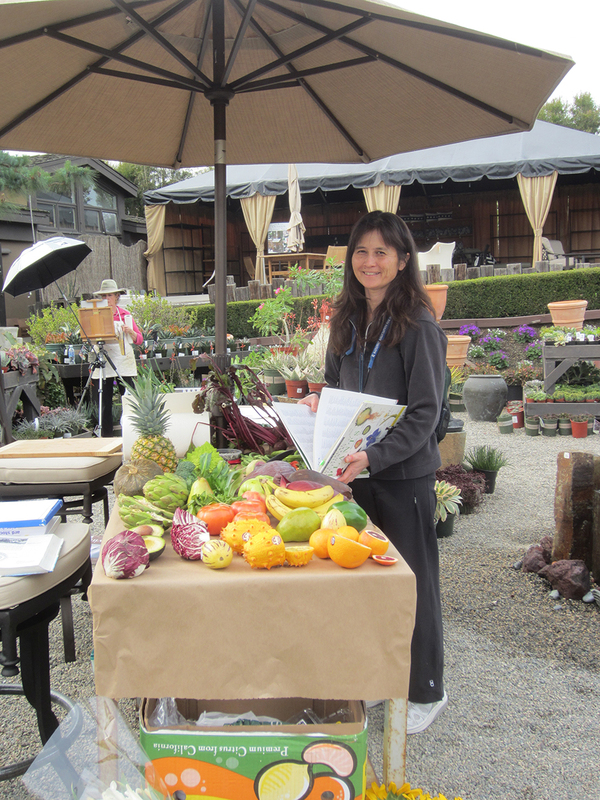 Roger’s Gardens is located at 2301 San Joaquin Hills Rd., Corona Del Mar, CA 92625, 949.640.5800. The exhibition will continue from May 4 until June 8, 2014. 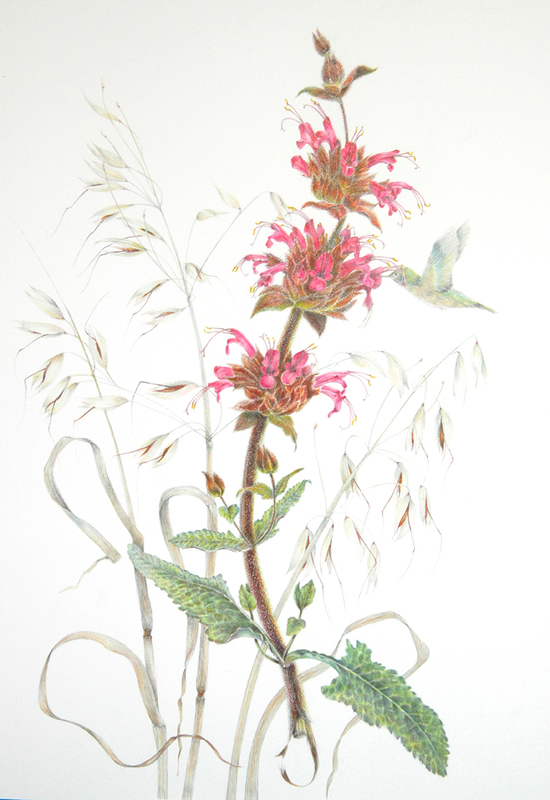 “Paper Farm: Works on Paper” is an exhibition illustrating Southern California farm life and detailing regional plants and animals using ink, paint, pencil, and watercolor. 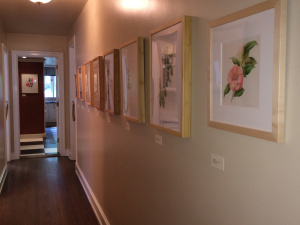 BAGSC members Diane Daly, Clara Josephs, Joan Keesey, Terri Munroe, Mitsuko Schultz, Janice Sharp, and Deborah Shaw have artwork in the exhibition. A lot will be happening at The Great Park on that same day, May 4, including The Groves Antique Market and the Certified Farmers Market. The Groves Antique Market has antiques, fine art and collectibles for sale, and is located on the runways behind the Great Park. The Certified Farmers Market features fresh, locally grown fruits and vegetables, handcrafted artisan products, live music and entertainment, car shows, and a selection of gourmet food trucks. 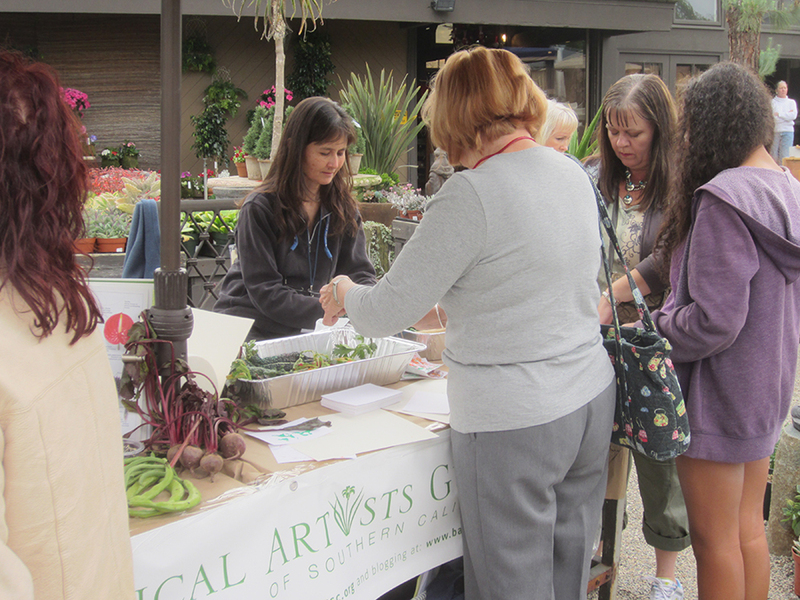 You can also explore the Farm + Food Lab and talk to UCCE Master Gardeners about home gardening tips. The Farmers Market will be open early May 4, at 8 am, and is dog and pet-friendly, too. The Living Room Talks program will also take place in the Gallery at 1:00pm on that Sunday. The Living Room Talks at the Great Park Gallery provide a community gathering place for engaging conversations with local artists. Sunday’s artists include Bianca Barragan, a writer and one of five co-founders of the LA Zine Fest, and Yumi Sakugawa, a comic book artist. Field trips for 1st grade students have been ongoing since March, and have included the art exhibition. The students have enjoyed the show and are inspired by the creativity. Directions can be found on the website, and on each of the linked pages listed above. Parking and admission are free. 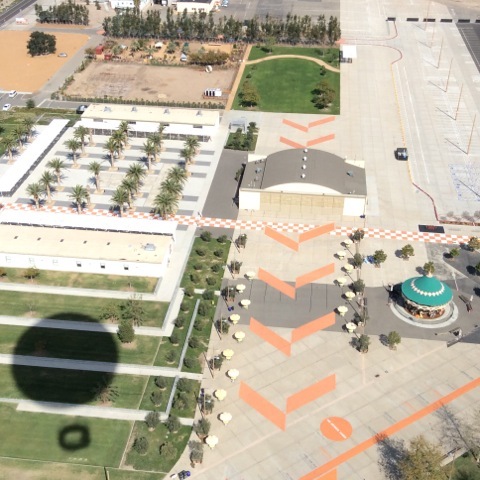 And yes, there will be balloon rides, soaring 400 feet above the park. Availability to fly is on a first-come, first-serve basis and dependent on wind and weather conditions. Prices for balloon rides are: Adults (19 and older), $10.00; Children (18 and younger with paid adult), free; Children (12 – 18 years old, without paid adult), $5.00. fir0002, flagstaffotos.com.au, from Wikimedia Commons. Licensing/copyright: This image is not in the public domain. Under the CC BY-NC: free to copy, distribute, transmit and adapt this work provided that correct attribution is provided. 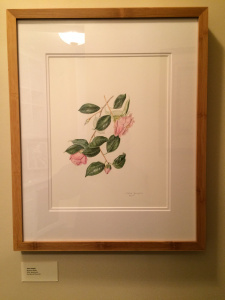 Need camellia inspiration? Here are camellia shows you can visit in the coming weekends. Some of these shows include plant sales. 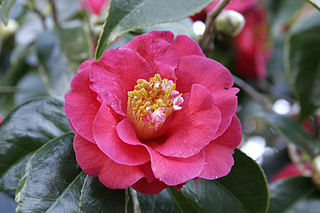 Or, combine a show visit with a trip to Nuccio’s Nurseries, growers of rare camellias and azaleas since 1935! If you’ve never been to Nuccio’s, it’s a Southern California landmark and treasure. 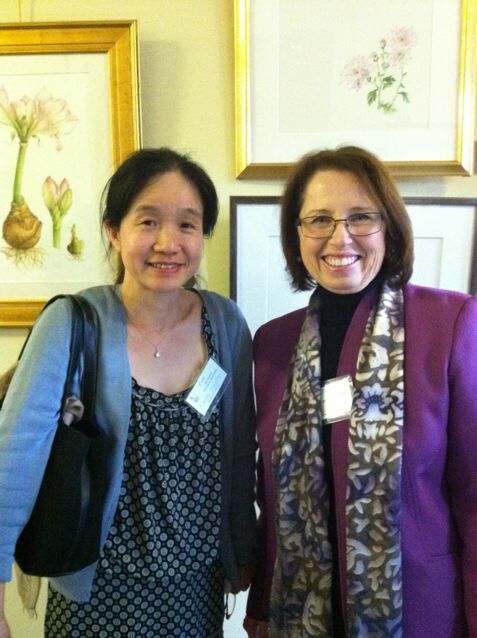 On Saturday, February 2, 2013, BAGSC participated in Roger’s Garden’s first “Day of Art” in Newport Beach. Fifty artists, using different media participated in a full day of drawing and painting demonstrations and workshops. The “Day of Art” was free to the public and for all ages. Pat Mark talking with visitors to the BAGSC Botanical Art Information Table. 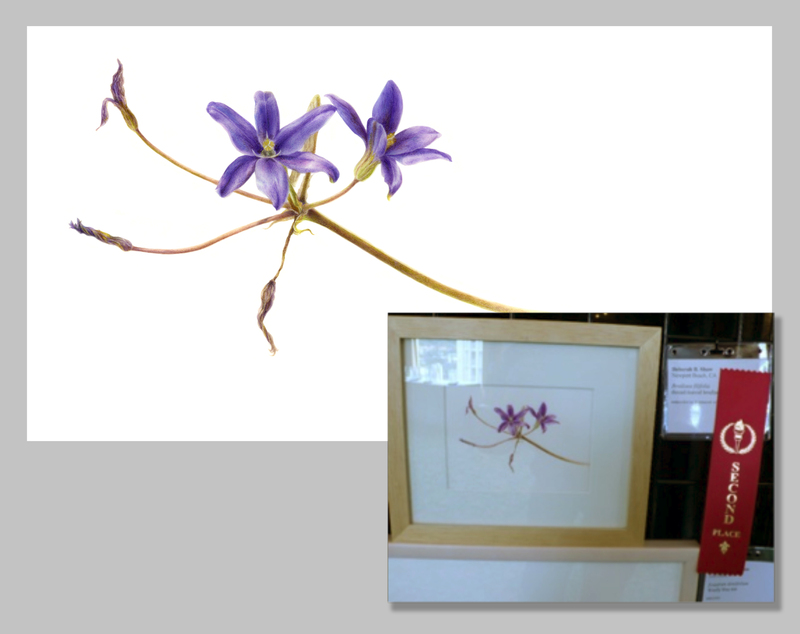 The Information Table also displayed books, originals and prints of contemporary and historical botanical art and scientific illustration. Photo by Peter Conlon. 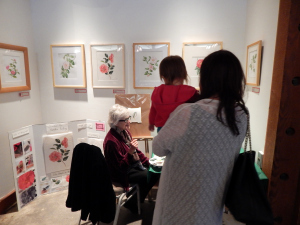 Additionally, BAGSC had an interactive table where visitors could explore the botany (and some unusual) fruits and vegetables, and make stamp prints with them. 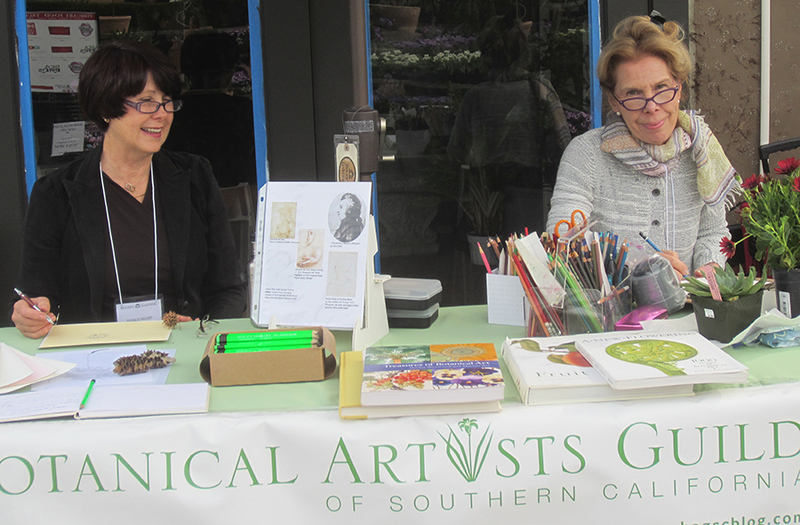 BAGSC also had a botanical art information table, with a display of originals, prints and books of all kinds of botanical art, from scientific illustration to plant portraits, historical and current. Tania Marien at the BAGSC Interactive Table, photo by Deb Shaw. BAGSC artists participating included: Diane Daly, Clara Josephs, Arillyn Moran-Lawrence, Sue Kuuskmae, Alyse Ochniak, Tania Marien, Deborah Shaw, Pat Mark, and Janice Sharp. 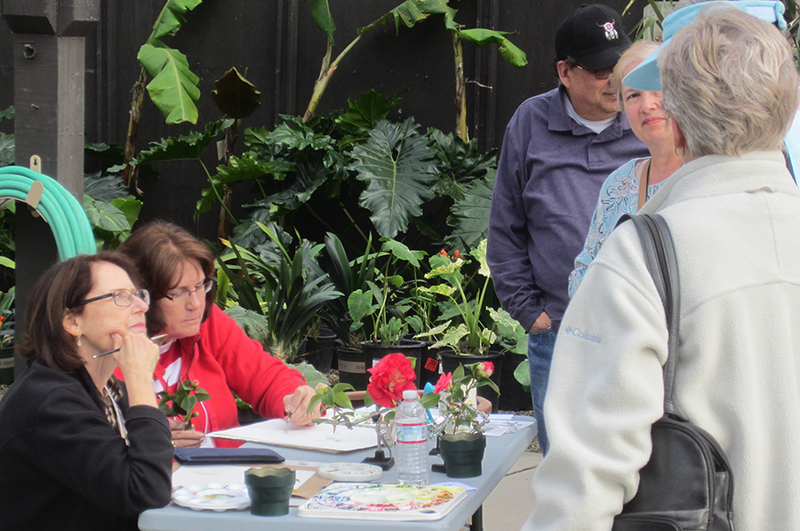 Tania Marien and Deb Shaw gave a two-hour workshop in the afternoon in the outdoor amphitheater on drawing flowers and leaves in pencil, with drawing boards, drawing paper and pencils provided by Roger’s. A watercolor and pastel workshop was offered in the morning by plein aire artists David Damm and Gill Dillinger, and a gourmet food truck, “Bite Me Foods” provided lunch for those who were hungry. Tania Marien and visitors to the BAGSC Interactive Table. Kids of all ages used fruits and vegetables to create stamp art. The event had been postponed from the previous Saturday due to rain. The weather held out this Saturday, and the event was packed with enthusiastic participants, even with the change in schedule. People and their dogs strolled the grounds, bought plants and took in the art. 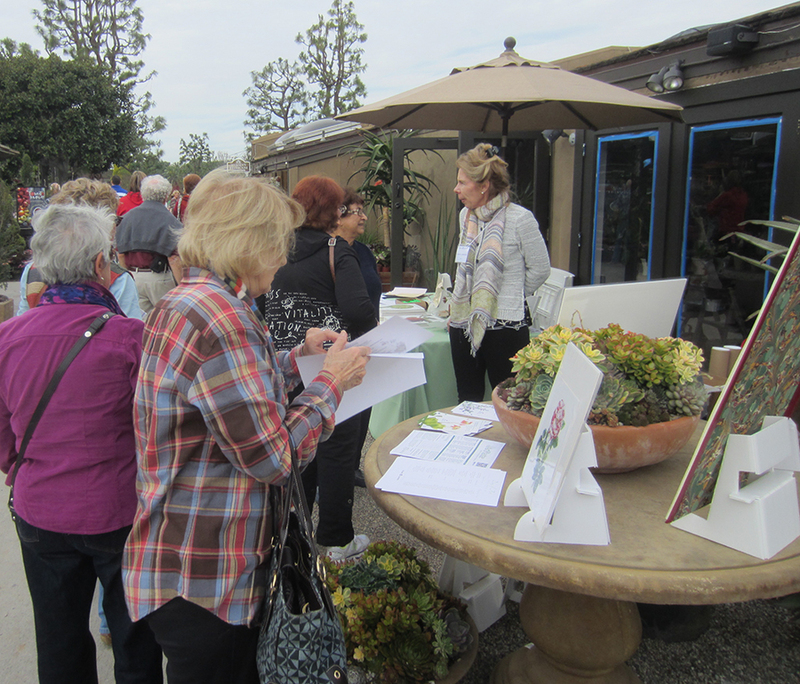 Attendees were eager to watch the demonstrations, and BAGSC members spent the day talking about botanical art, different media and techniques to interested customers. 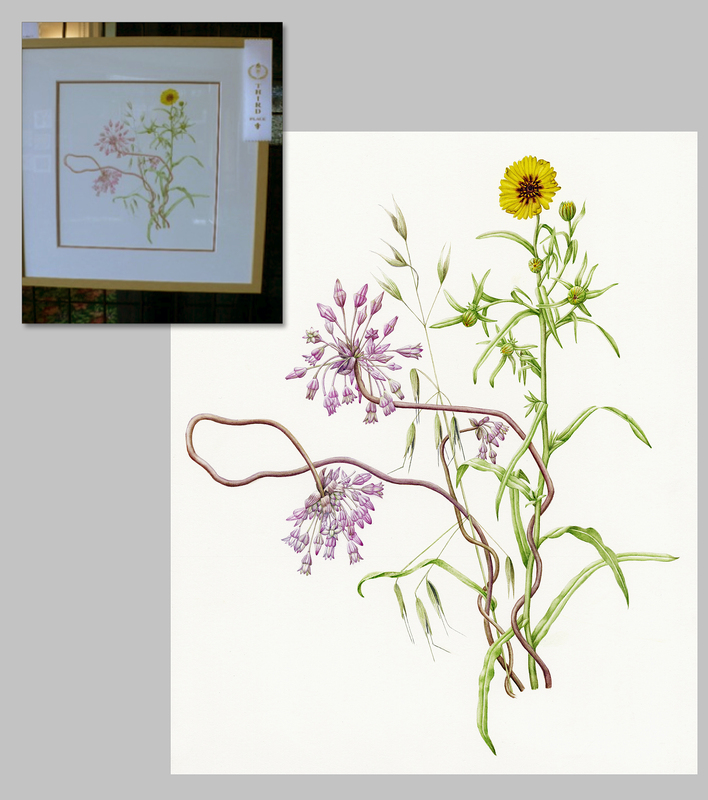 Many inquired about botanical art classes and were complimentary about the day’s events. Roger’s reported overwhelmingly positive comments from their guests. Thank you to all who participated, and to Roger’s for hosting the event. We hope there will be more in the future! 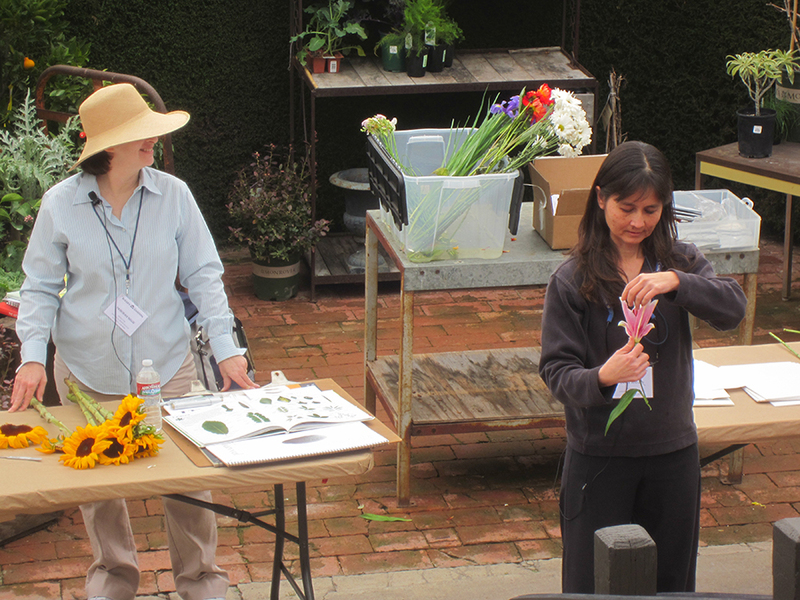 Deb Shaw (left) and Tania Marien (right) teaching a workshop about how to draw flowers and leaves in pencil. Photo by Peter Conlon. 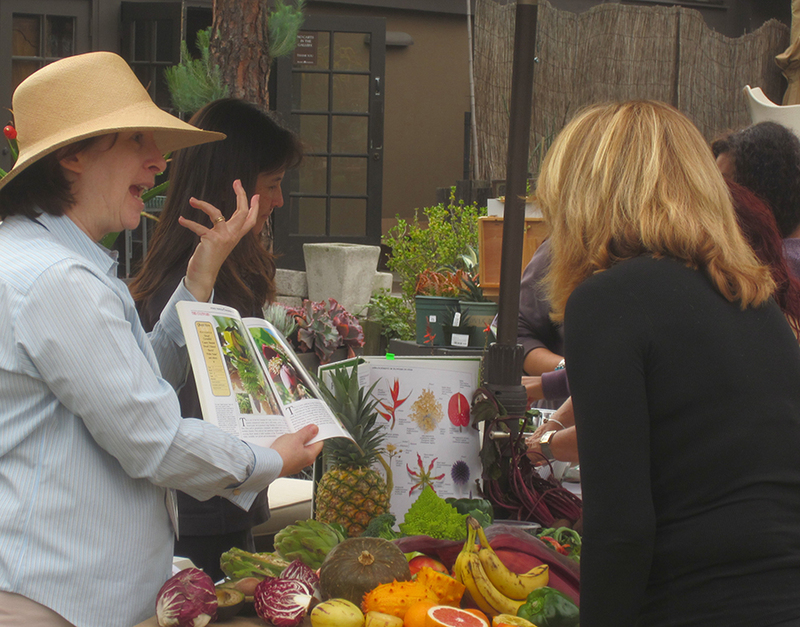 Deb Shaw expressively describing the morphology of a banana inflorescence to Theresa Marino from Roger’s Gardens. Photo by Peter Conlon. 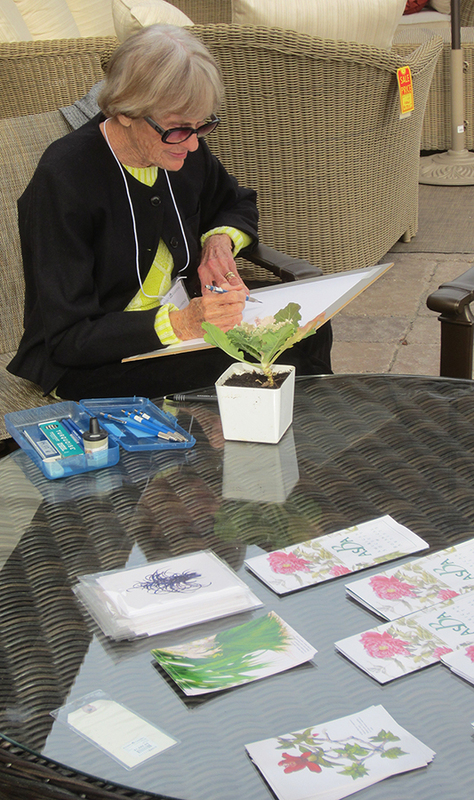 Sue Kuuskmae chose to draw in the shade section of the nursery, near a fountain. Photo by Deb Shaw. 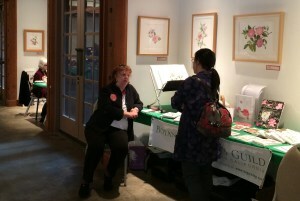 Clara Josephs (left) and Diane Daly (right) discuss botanical art and painting with visitors. Alyse Ochniak demonstrating in the garden, photo by Deb Shaw. 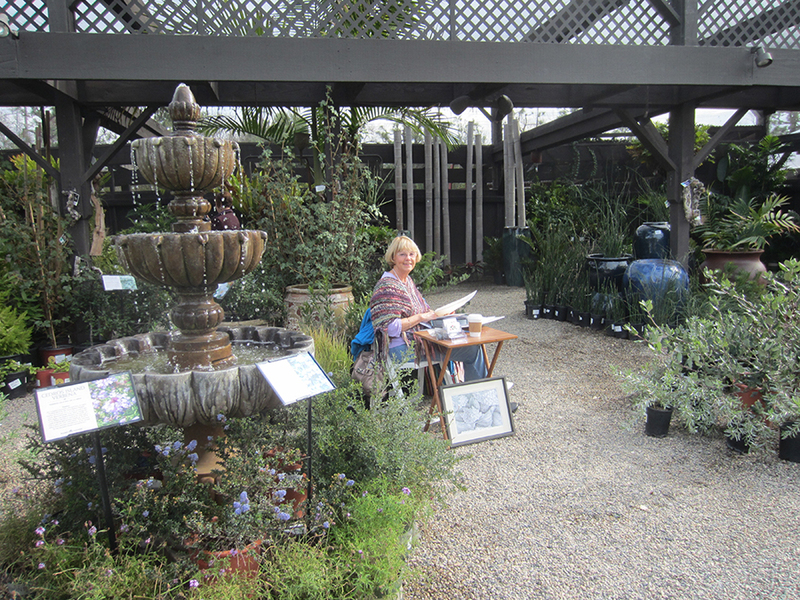 Arillyn Moran-Lawrence demonstrating in the garden (in the luxurious outdoor furniture section). Photo by Deb Shaw. 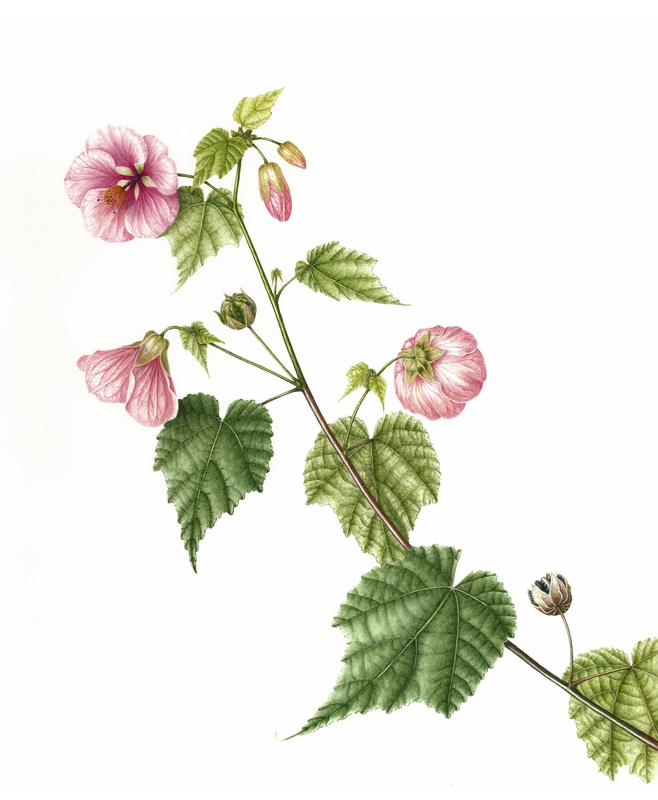 Abutilon, Flowering Maple (Rosy Dewdrops) by Mitsuko Schultz, watercolor, © 2012, all rights reserved. The following BAGSC members have been accepted into the 14th Annual Botanical Art Exhibition at Filoli, in Woodside, California. There were 138 entries submitted this year and the jurors selected 56 works. The exhibit reception is scheduled for Thursday, March 29 from 5:00 p.m. – 7:00 p.m. and the show runs through May 13, 2012. 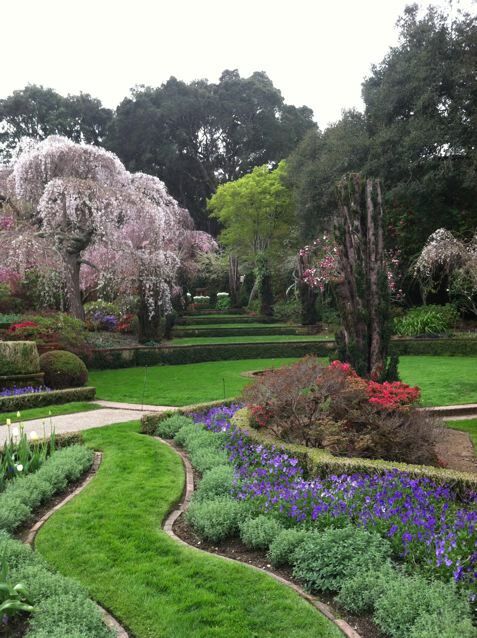 Although the reception is free, reservations are required, however, and can be made by online at the Filoli Exhibits page, or by phone to Member Services at 650-364-8300, extension 508. Congratulations to all who entered, and to all who were accepted to the show! 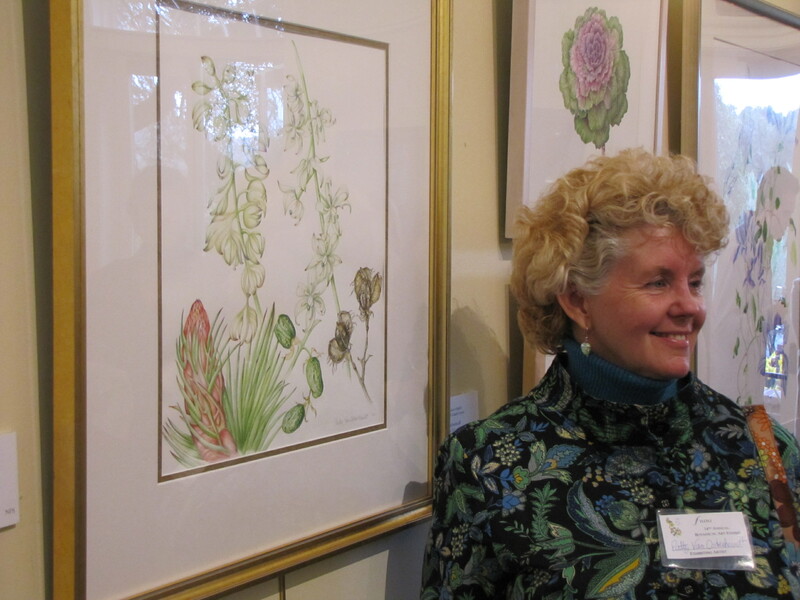 It was very gratifying to see the Botanical Artists Guild of Southern California (BAGSC) so well represented at the Botanical Art Exhibit at the CNPS Conservation Conference 2012 in San Diego at the Town and Country Resort. There were thirteen pictures by seven BAGSC members: Diane Daly, Estelle DeRidder, Clara Josephs, Joan Keesey, Janice Sharp, Deborah Shaw, and Dorthea Yellot. Members of our group won some prizes as well: Deborah Shaw received a second place ribbon for her watercolor on vellum of Thread-leaved Brodiaea; Joan Keesey won a third place ribbon for her watercolor of Snake Lilies and Elegant Madia; Estelle DeRidder won an honorable mention for her colored pencil of Hummingbird Sage. This is the second CNPS exhibit that I have participated in, and I thought that the pictures were better displayed and of a higher quality. I am particularly interested in California Native Plants, so I find a show like this a real treat. I also like botanical exhibits where there is a focus or theme. I find the juxtaposition of “Turnips & Tulips”, “Corn and Camellias”, “Radishes & Roses”, jarring and difficult to evaluate. I hope BAGSC will consider sponsoring exhibits that are more focused—a plant family such as the mustard, pea, rose or lily family, plants of a particular region, trees, succulents, etc. The options are endless, but I think it makes a more interesting and informative exhibit.